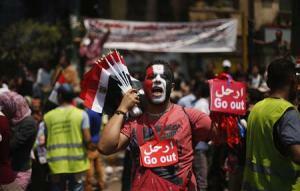 Egyptian protesters out in full force. CAIRO — President Mohamed Mursi rebuffed an army ultimatum to force a resolution to Egypt’s political crisis, saying today that he had not been consulted and would pursue his own plans for national reconciliation. But the Islamist leader looked increasingly isolated, with ministers resigning, the liberal opposition refusing to talk to him and the armed forces, backed by millions of protesters in the street, giving him until tomorrow to agree to share power. Newspapers across the political spectrum saw the army’s 48-hour deadline as a turning point. Last 48 hours of Muslim Brotherhood rule, the opposition daily El Watan declared. Egypt awaits the army, said the state-owned El Akhbar. The confrontation has pushed the most populous Arab nation closer to the brink amid a deepening economic crisis two years after the overthrow of Hosni Mubarak, raising concern in Washington, Europe and neighboring Israel. Protesters remained encamped overnight in Cairo’s central Tahrir Square and protest leaders called for another mass rally today to try to force the president out. Senior members of Mursi’s Muslim Brotherhood used the word “coup” to describe the military ultimatum, backed by a threat that the generals will otherwise impose their own road map for the nation. In a statement issued nine hours after General Abdel Fattah al-Sisi delighted Mursi’s opponents by effectively ordering the president to heed the demands of demonstrators, the president’s office used considerably less direct language to indicate he would go his own way. “The president of the republic was not consulted about the statement issued by the armed forces,” it said. “The presidency sees that some of the statements in it carry meanings that could cause confusion in the complex national environment.